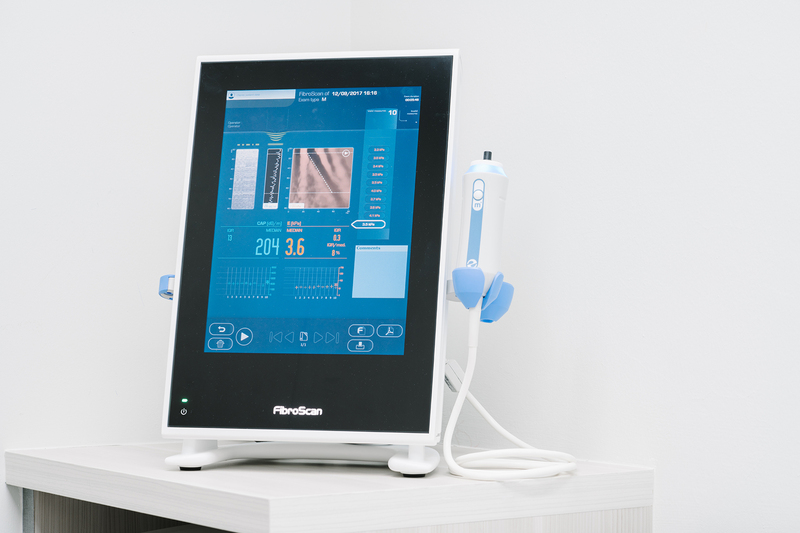 The FibroScan is a non-invasive and pain-free method of measuring liver scarring (fibrosis) and quantifying the level of fat (steatosis) of the liver. It is a quick, safe, reliable and scientifically proven test which can be performed in our clinic. The test typically takes about 15—20 minutes. A probe will placed on the surface of your abdomen. A mechanical pulse passes through the liver creating an “elastic wave”. This technology measures the velocity of the sound wave passing through the liver and converts it into a liver stiffness measurement. In addition, the controlled attenuation parameter (CAP) quantifies the degree of ultrasound attenuation based on vibration controlled transient elastography. The results of your FibroScan will be available immediately after the scan. Early detection of liver fibrosis provides an opportunity to arrest and potentially reverse ongoing damage to your liver. Submitting this form does not guarantee you a slot, please wait for our confirmation email.